LPC LAHORE: Master Paints/Rizvi’s outpaced Newage/Guard Group by 10-7½ in the Master Paints Polo Cup 2018 main final played here at the Lahore Polo Club (LPC) ground on Sunday. Juan Cruz Losada emerged as hero of the day as he struck superb six goals for the winning side while Hamza Mawaz Khan slammed in two and Mumtaz Abbas Niazi and Farooq Amin Sufi one goal each. From the losing side, which had one and half goal handicap advantage, Salvador Ulloa hammered a hat-trick while Taimur Ali Malik banged in a brace and Raja Arslan Najeeb contributed one goal. 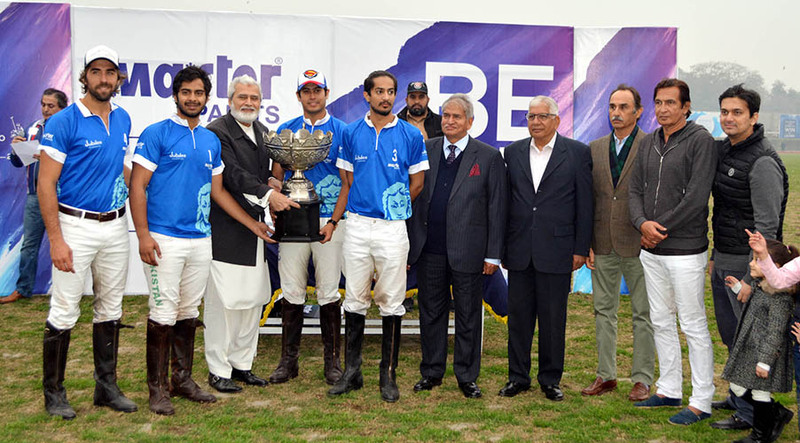 The match started with Newage/Guard Group having one and half goal handicap advantage, but they couldn’t get benefit from it as the first goal of the first chukker came from Losada, who fired a field goal to make it 1-1½ and soon Mumtaz Abbas fired a field goal to five Master Paints 2-1½ lead. In the dying moments of the first chukker, Salvador smashed in a superb field goal to gain 2½-2 lead once again. The second chukker saw total dominance of Master Paints, who pumped in fabulous four goals to stretch their lead to 6-2½. Losada was the striker who added two more in the tally while Hamza Mawaz and Farooq Sufi added one goal apiece. Newage/Guard Group bounced back in style in the third chukker by banging in a brace through Raja Arslan and Salvador (one goal each) to reduce the deficit to 6-4½. But Losada struck another field goal to further enhance Master Paints lead to 7-4½. Salvador continued his struggle which paid off when he got a 30-yard penalty, which he successfully converted to make it 7-5½. In the dying moments of the chukker, Hamza Mawaz came from behind to score a field goal to make increase his team’s lead to 8-5½. The fourth and last chukker of the final saw both the teams trying to score maximum goals to ensure their title triumph, and this time, Newage/Guard Group made a strong comeback by thwarting two tremendous goals – both by Taimur Ali Malik – which brought them very close to Master Paints score as it was 8-7½. It was anyone’s game as Newage were looking in great form and attacking their opponents’ goal consecutively, but Master Paints not only defended very well but also hammered two magnificent goals through hero-of-the-match Losada to emerge as title winners. Bilal Haye and Macos Araya supervised the final as field umpires. Earlier in the subsidiary final, half goal handicap advantage helped Diamond Paints defeat Master Paints Black by 4½-4. Macos Araya was top scorer from the winning side, which had half goal handicap advantage, while the remaining one came from Mir Huzaifa Ahmed. From the losing side, Hissam Ali Hyder also slammed in a hat-trick while Saqib Khakwani struck the remaining one, but the half goal handicap advantage for other team cost Master Paints Black the third position.